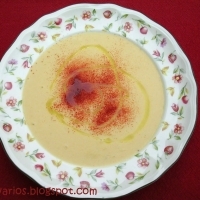 Creamy soup ready in 30 minutes, low-fat but very tasty. Hubby loves it!! Make double batch since it freezes nice, so you can always have a comforting soup for supper. We like this cream with hot garlic bread. In a medium pan heat oil on medium, add leeks and garlic. Cook until leek is transparent. 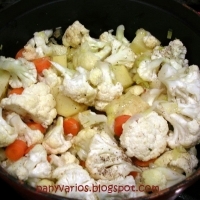 Add cauliflower, carrots and potatoes. Stir well. Add broth just to cover veggies and season with salt and pepper. Cover and bring to a boil. Reduce heat until just simmering. Cook for about 20 minutes or until vegetables are tender. Mix in a blender, working in batches if necessary, until soup becomes a cream. 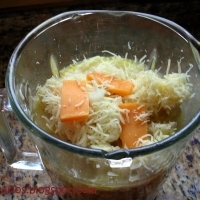 Add cheese, Mix again and season to taste. When ready to serve, garnish with some sweet pimentón (Spanish paprika) on top and drizzle a little extra virgin olive oil for extra flavor. Plus 29 othersFrom around the world! It's the day after Hurricane Sandy and we got off easy in Toronto. But still, it's been a grey, gloomy day, so I got busy and made your soup recipe this afternoon. Bowls of golden goodness for dinner tonight (thanks to the carrots and the cheddar cheese I used), and more safely packed away in the freezer for hot lunches at work! Thank you for a wonderful recipe! this was great!!! i only had one leek, 2 miniature cloves of garlic, no potatoes, and it still turned out amazing! it's the first time i ever used leeks, and I must say, it really made the recipe! WOW!!! I must admit that I did not have very high hopes for a cream soup made without cream, but in keeping with my new years resolutions, I was looking for a healthy soup to help warm the bones on a cold winter's day. I made this for the first time today, and It is AMAZING!! It is far better than I expected, and so thick and hearty! Thank you for this fantastic recipe, it has become an instant favorite! I've made this several times already and everyone loves it! My husband and one of my children, don't like to eat veggies at all. It's a daily struggle. So I told them this was a creamy cheesey type of soup. They tasted it and their eyes lit up. Now they ask for it all the time! They have no idea it's so low in fat and full of Cauliflower,which is the veggie the like the least! Thank you so much for this recipe! Wonderful, I love the cheese in this soup. I also like there there is no cream. I will make this for my wife! This looks really, really good! Great for this "cold" weather we're having! 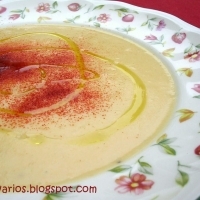 Inmaculada, I made this soup today - it is 5 below zero here and we wanted something warm and comforting. The soup is EXCELLENT - so flavorful and I loved that there was no added fat from butter or cream...healthy, tasty and a true keeper. Thank you so much for sharing this - it is a new family favorite! I like the way this looks with the olive oil drizzled on top.I bet this taste really good I will have to try this. Hey, friends, I´m so glad you liked this soup... Thanks for the visit and the nice comments. I'm at the library right now printing this out, can't wait to try this. I love a creamy soup that way i can sneak a few things in that my son thinks he hates and he will never know. This is a definite "must make" - my daughter's favorite soup, and I love the low fat content, and it's so nutritious...perfect! oh yummy!! 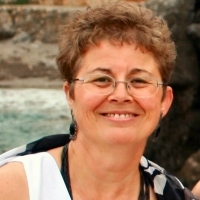 Thnaks for the post!! Oh WOW. Keeping this one.